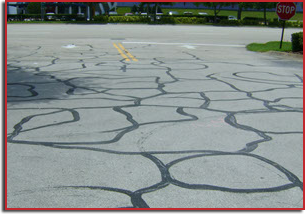 Hot Rubber Crack filling is a vital part of any Road maintenance plan to greatly prolong the lifespan of your asphalt especially in cold weather climates areas. We use proper equipment, the best materials, and correct application methods to ensure proper adhesion and long lasting results. 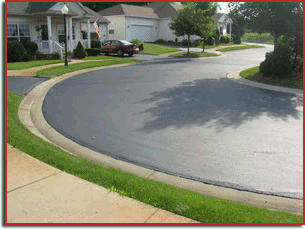 We offer sealcoating services for public roads and neighborhood streets and have completed many road and street projects. 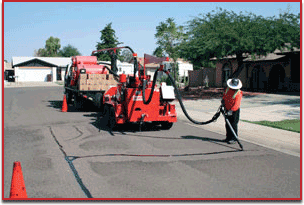 Sealcoating offers many benefits for Asphalt. It protects the surface area from “ravelling” and deterioration from the elements which actually greatly reduces cracking and blacktop failures in the first place. We offer line striping services for Roads and Streets including new layouts, sealcoating, or restriping using the highest quality paint products available.Our striping is also A.D.A. compliant. Paving a new Road or Street from scratch for new construction, repaving an old parking lot by removal and replacement, and even overlays are all offered by our parent company KAPLAN Paving.